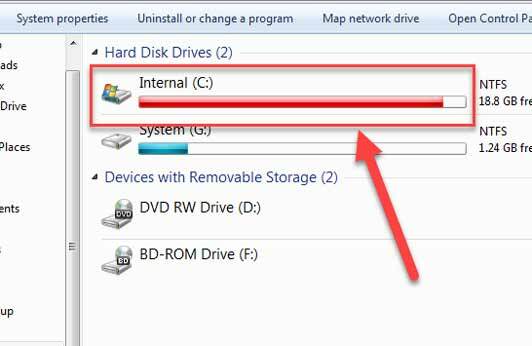 Home Windows Hard Drive Full, Don’t Know Why? Hard Drive Full, Don’t Know Why? Windows: Hard Drive Full, Don’t Know Why? So We have only 1GB left of we 256GB SSD, but I have no idea why. I went to the Uninstall Programs and went down the list, and nothing is sticking out, and I don’t understand how I have low space? Is there a program that I can use to see more info on what is taking up so much space? Also, look into your pagefile settings, hibernation, and Restore Point settings. WinDirStat is a disk usage statistics viewer and cleanup tool for various versions of Microsoft Windows. Note: if you are looking for an alternative for Linux, you are looking for KDirStat (apt-get install kdirstat or apt-get install k4dirstat on Debian-derivatives) or QDirStat, and for MacOS X it would be Disk Inventory X or GrandPerspective. Please visit the WinDirStat blog for more up-to-date information about the program. How do open a file in Notepad++ from cmd? Use virt-manager to share files between Linux host and Windows guest?